As summer gives way to fall, you may find yourself seeking an adventure of a different color. Well, simply head out on a quick day trip from Park City. Mountain peaks, rushing rivers and pastoral fields of wildflowers will start to give way to spectacular fall colors. These easy day trips make for a memorable way to spend a morning or afternoon. 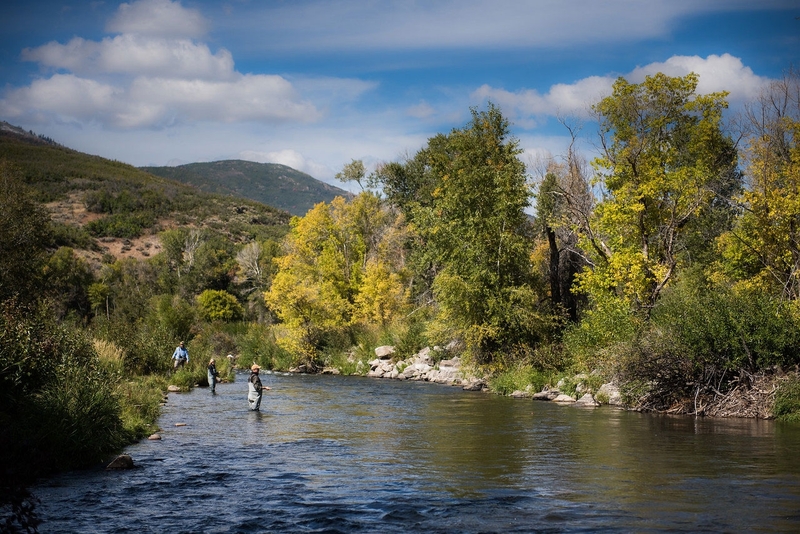 Head on out to the Blue-Ribbon awarded Provo River for a day of fly fishing. If you want to catch some amazing fish in a beautiful setting, then a day of fly fishing is the day trip for you. The Blue-Ribbon designation identifies recreational fishing areas of extremely high quality. There are only six states that have fishing at this level and the Provo River of Utah just happens to be one of them! Ruth Lake is an excellent option for all levels of hikers. The basic out-and-back hike takes about one hour but can be extended to explore the many lakes in the region. The Ruth Lake trailhead is easy to find, simply drive 35 miles into the Uintas on State Road 150 from Kamas, also known as the Mirror Lake Highway. The trailhead is located near mile marker 35. If a scenic drive is more your speed, head up the Guardsman’s Pass Scenic byway before it closes for the winter season. You can take it up to the pass and head toward Midway or Salt Lake City. We recommend the Midway side, and stopping off for some Mexican food at Tarahumara, some shopping in the square or a scoop of ice cream at Fill Er Up Coffee Station. Of course, we wouldn’t be adventure guides if we didn’t recommend an adventure. Check out the WOW biking trail or take the kids fishing at Wasatch Mountain State Park. Cecret Lake (pronounced Secret) is an easy to moderate hike filled with mountain top views and fields of wildflowers. This hike will inspire even the most reluctant photographer. Head up Little Cottonwood Canyon Road to the Albion Basin Campground. The trail starts on the West side of the campground. During peak wildflower season, during the summer months, the parking area can fill up quickly. A great alternative is the Albion Meadows Trail located just behind the Albion Grill, where there is plenty of parking. You’re sure to be impressed with the fall colors heading up Weber Canyon in Oakley. We recommend a start at the Road Island Diner and then a slow meander up the canyon to Smith & Morehouse Reservoir. There is a lengthy trail that goes around the lake if you’re really feeling adventurous. Or stop for the breathtaking views and to throw a few stones into the lake, and then head back down for your next adventure. Diamond Fork Hot Springs are a series of cobalt blue soaking pools that ends in a beautiful waterfall. The trailhead is easy to find, simply take I-15 South to Spanish Fork. Once there, take exit 257 to US-6E. Drive 11 markers and take a left at mile maker 184 onto Diamond Fork Road. Follow this road 10 miles until you reach the trailhead parking lot. The trail is easy to moderate and is about 2.5 miles to the first pool. Make sure to check conditions before you go as the Forest Service will close the road due to snow and/or ice. The best hiking trails can vary by time of day, let alone day of the week, month or year. Let the experienced guides at All Seasons Adventures work with you to find the absolute best hike for your desires and abilities. In the hot summertime, we know just where to find the shade. And in the height of fall, we’ll lead you right to the brightest colors. Take the work out of making memories with your friends and family by hiring an experienced guide. There are so many wonderful day trips from Park City. Whether solo or with a group all you need is good planning, some snacks, sunscreen and a handy camera to capture these awesome adventures.